Within Moscato’s extended family, it’s fragrant, fizzy Moscato d’Asti that best captures the magic. In Piedmont, Moscato d’Asti is poured during the winter holidays—a festive dessert wine typically served with raisin-studded panetone cake. I admit I’ve enjoyed my share (and then some) of this combo. But I’ve always thought moscato goes best with a swimming pool. After a hot summer day, there’s nothing more heavenly than a glass of this delicately sparkling wine, as fragrant as honeysuckle and as light as dew. Turns out, I’m in good company. “I think the best season to drink moscato is summer,” affirms Paolo Saracco, whose eponymous winery is a leading producer of Moscato d’Asti. But I’d accept a glass anytime, anywhere. To me, Moscato d’Asti is the ultimate expression of the moscato grape, which is pretty seductive in all its forms. And there are many. One of the oldest-known grape varietals in the world, moscato is a sprawling family with four principle varieties and countless sub-varieties. The most aromatic is moscato bianco (also called muscat blanc). Scientists believe its mother grape originated in Armenia 2000 to 3000 years ago. It migrated from the Black Sea down to the Middle East, then traveled north during the Middles Ages with Christian Crusaders returning from the Holy Land to various points in Europe. Naturally prone to mutation, moscato diversified, adapting to climates in France, Germany, Italy, Hungary, and beyond. The first thing to know about moscato sparklers is that Moscato d’Asti is not the same as Asti Spumante (now simply called Asti). The difference is like that between a plate of beef-cheek ravioli with black truffles at Mario Batali’s Babbo and a can of Chef Boyardee. One’s artisan, the other industrial. Saracco’s family-run winery makes a half-million bottles annually, sourced from their own grapes. Most Moscato d’Asti producers are smaller still, handcrafting 10,000 to 100,000 bottles. A firm like Martini & Rossi churns out 20 million bottles of spumante. All told, only 5 percent of Piedmont’s moscato grape production goes into Moscato d’Asti. Beyond scale, there are differences in style: Asti is spumante, which means lots of fizz, with higher atmospheric pressure and thus a heavy champagne-style bottle and mushroom cork. The sparkle in Moscato d’Asti is gentler, frizzante, allowing a normal cork. Moscato, one of the rare varieties that's equally good as a table grape and a wine grape. Variances in fizz indicate differences in sugar and alcohol levels. For those who skipped basic chemistry, know this: Fermentation produces two byproducts: alcohol and carbon dioxide. They’re the result of yeast gobbling up grapes’ natural sugars. If you stop fermentation midway, some sugar is left over, thus there’s less alcohol and CO2. In the case of Moscato d’Asti, fermentation is stopped when alcohol reaches 4.5–6.5% (below most beers). This leaves a nice dose of residual sugar. 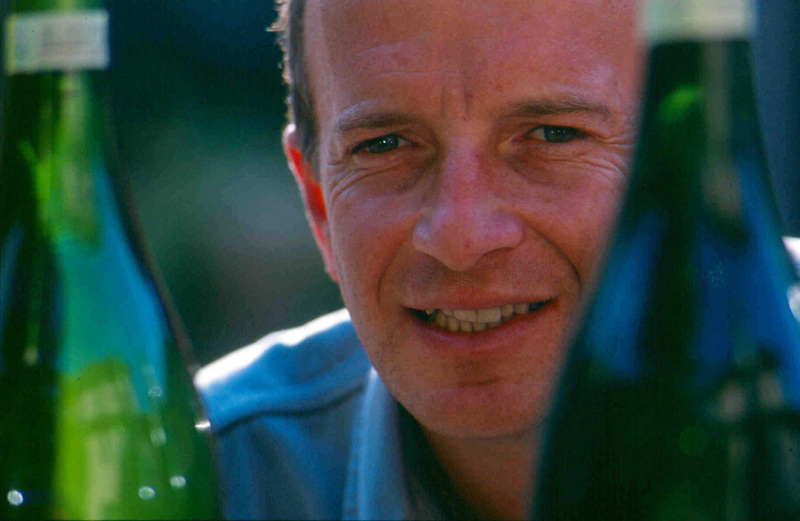 With Asti, fermentation is arrested at a moderate 7–9.5%, producing a drier wine with more sparkle. With any moscato, sugar matters—but not for obvious reasons. Rather, it has to do with aroma. Moscato has an unmistakable perfume: a heavenly bouquet of orange blossom, acacia, or honeysuckle with notes of stone fruits. (If there ever was a nectar of the gods, this is it.) These aromas come from terpenes, a hydrocarbon linked to sugar. Get rid of the sugar, and you reduce the aroma. Terpenes are also unstable. Contact with oxygen destroys the primary perfumes, so it’s important to immediately capture and preserve them. (Aging does nothing to enhance terpene-derived aromas.) This is where the wonders of modern technology come into play. Moscato d’Asti as we know it today wouldn’t be possible without refrigeration via temperature-controlled stainless steel tanks and sophisticated filtering systems to remove hungry yeast. “Sugar is tied to aromas,” says Saracco. “So we believe the best expression for this grape is to make it the way we do.” Moscato d’Asti leaves enough fresh, unfermented juice in the finished wine to transport moscato’s heavenly aromatics, like a messenger from Bacchus. Saracco finished enological school in Alba at precisely that time and returned to the family farm with new ideas and ambitions. “I made a revolution at home,” he recalls with a laugh. “It was a generational conflict. My father was used to working in a certain way.” Saracco’s father, like his grandfather and great-grandfather, sold their wine in bulk to the Asti Spumante and vermouth firms. But by 1988, Saracco was bottling under the family name, part of the first generation in Piedmont to make the modern incarnation of Moscato d’Asti DOCG. Today Saracco’s floral label is ubiquitous in Piedmont and abroad. It’s as pretty a wine as one can imagine on a summer’s night. So if you have a pool, picnic, or party, grab a bottle and chill. Epitomizes Moscato d’Asti’s orange-blossom perfume and frizzante, delicately sweet style. From the Dolomites, this still, semi-dry wine from moscato giallo offers a tropical fruit nose. A passito from dried zibibbo (moscato d’Alessandria) grapes, this amber dessert wine is redolent of figs, apricot and honey. Published in the May/June 2009 issue of Tastes of Italia magazine.